You are currently browsing the tag archive for the ‘wildfire’ tag. 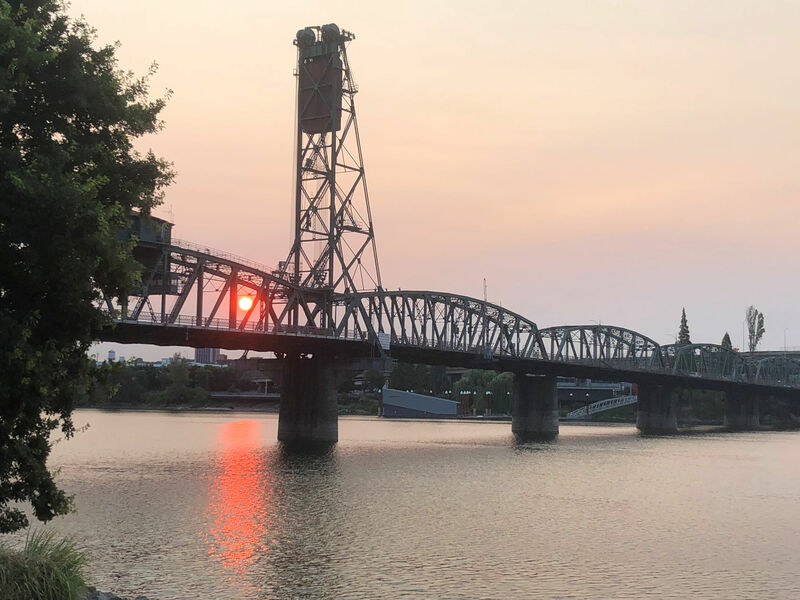 The sun attempts to penetrate our world over the Hawthorne Bridge in downtown Portland over the Wilamette River. I maintain a childlike appreciation for the natural forces and landscapes in my world that does not seem to fade as I grow older. The Columbia River holds my awe as a local landscape and a force itself. August reminded me constantly of the forested landscapes, and how they are changing under the force of wildfires. 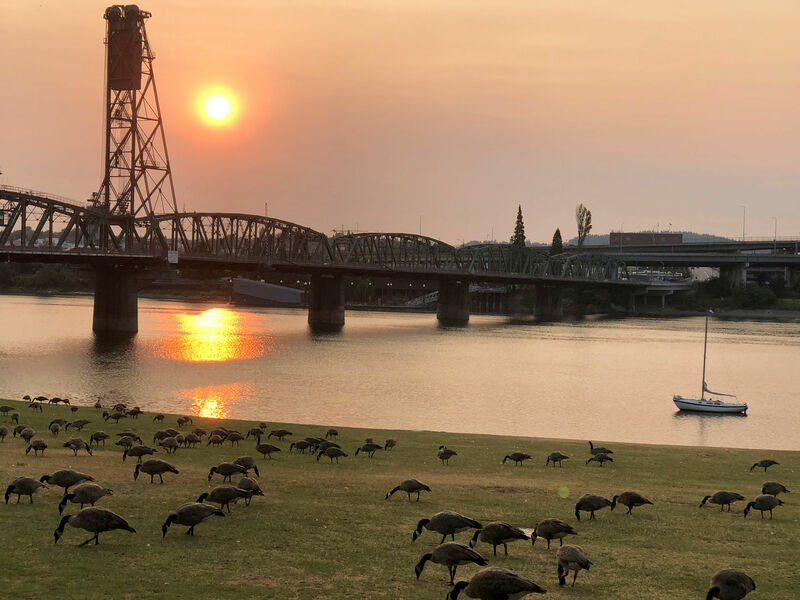 I have been able to capture some remarkable photos of rivers and smoke from those wildfires, as the two converge. Mondays I work at a tall building right on the shores of the Wilamette River. The rest of the week I work at home. Monday mornings before work I try to get in a short run before work, and thus have been able to see the effects of smoke from area fires on our city. Jogging past the marina is always picturesque. 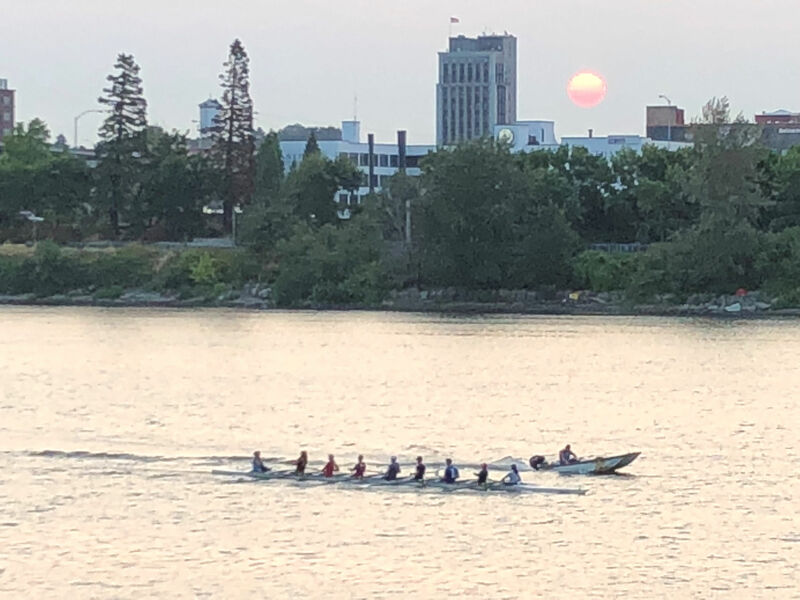 One morning I caught this blurry photo of teams practicing their paddling. Each week I find the sun at a different place in the sky. Here the red orb peeks through struts on my favourite Portland bridge: Hawthorne. 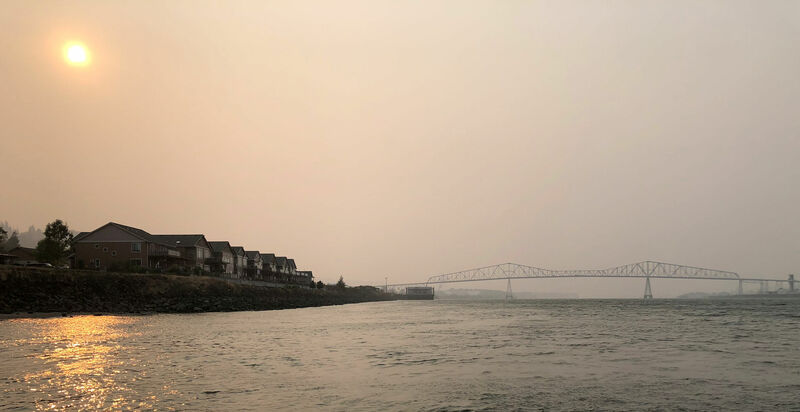 Smoke was so thick for a few days that I could actually smell it outside. 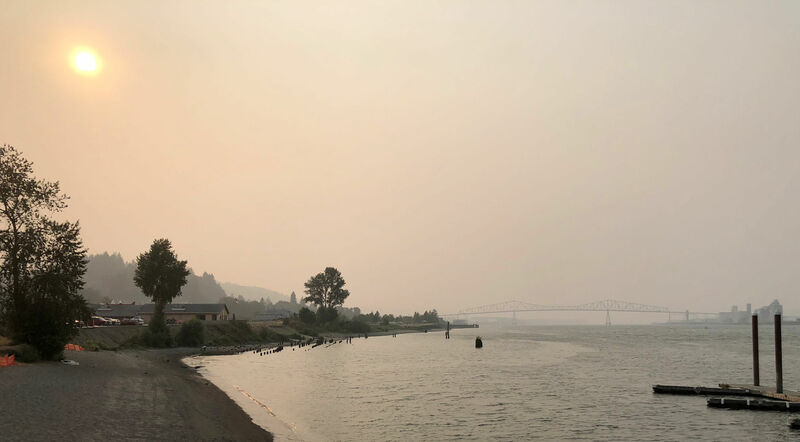 I am pretty sure that most of it is coming south to us from British Columbia, but the smoke is likely worsened by fires in Washington and southern Oregon as well. Every summer the West burns. A view of the afternoon sun from my house. All day long the light cast over my world has been orange. From morning, through midday, and into evening, the light is surreal: dimmed, tinted, and seemingly still. Maybe Mother Nature is holding her breath, watching and waiting, like me. 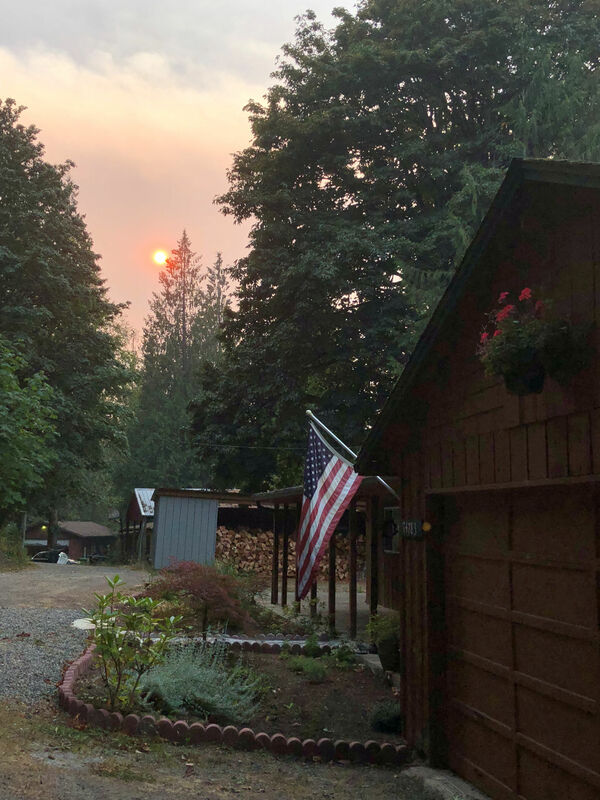 I am grateful daily that my own community is not burning, while I see facebook reports of my friends evacuating from their homes in other places. Smoke in the air reminds me that the threat is close to me as well. Returning across the Lewis & Clark bridge from Longview, Washington, I was startled to notice that from one shore I could not see across the Columbia River to the other shore. Instead of going home, I drove down to the waterfront to take a closer look. 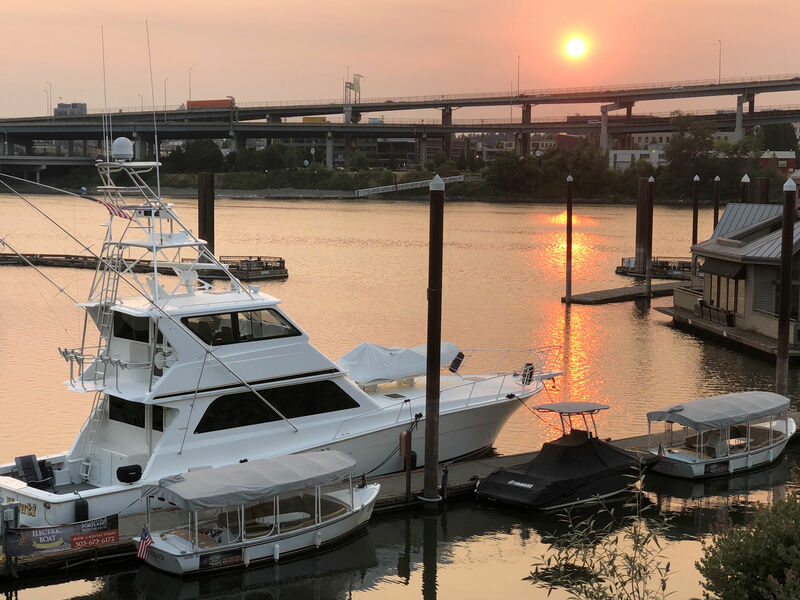 From the Rainier marina, looking toward the Lewis & Clark bridge, the last bridge to cross the river before you get to the coast, and the bridge at Astoria. The bridge is almost obscured from my viewpoint, a half a mile away. I moved down river to a spot closer to the bridge, but it remains faded in the murky skies. While at the Rainier marina, I stopped to read some information signs that talk a little about the Columbia and about my tiny town of Rainier. 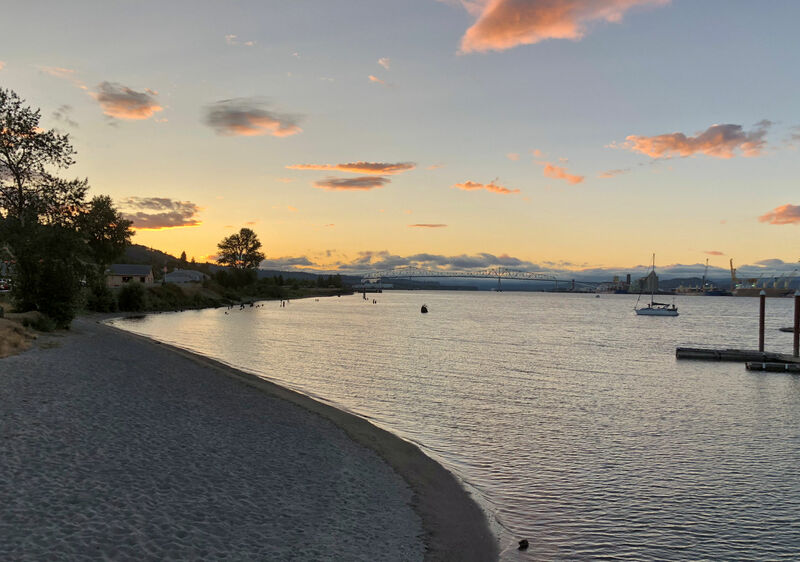 I’ll reproduce some of it here, because I am so proud of my beautiful river, even when it flows beneath worrisome skies. The Columbia River is the second longest river on the continent. It will fall more than 2600 feet in elevation as it flows 1270 miles from the Canadian Rockies to the Pacific Ocean. The elevation drop and the large water flow give the Columbia enormous potential to generate electricity. Currently the dams of the Columbia River Basin generate one third of all the hydro-electricity produced in the United States. The location of Rainier on the Columbia is a primary reason why it was established. Two days were needed to travel from Portland to Astoria before roads were built. Since Rainier is located in the middle, travelers spent one night in Rainier before they completed the second day of their journey. In 1805 Lewis and Clark traveled down the Snake River where they entered the Columbia. They finished their journey to the Pacific Ocean traveling down the Columbia. In 1852 Charles Fox donated 24 acres for a town site that would become Rainier. For the past two days it has been raining. For folks around here, the rain is a relief. Update: August 30, 2108. We had clear skies tonight and I stopped by the marina to take another photo so you can compare.